What is the Safe Helpline app? The Safe Helpline app is a free mobile resource created to meet the unique needs of members of the Department of Defense community affected by sexual assault. By downloading the app, you can access 24/7 support through the Safe Helpline phone and online helplines, get information and resources to help address the short- and long-term effects of sexual assault, as well as practical exercises, to help you manage your self-care. 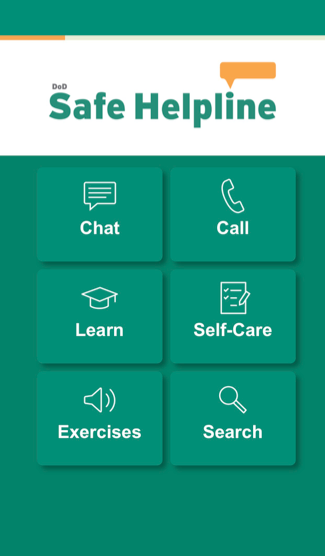 We also recognize that for many survivors stationed outside of the United States (OCONUS) additional limitations may arise when accessing resources, which is why the Safe Helpline app has been redesigned to give survivors access to a variety of support services and self-care exercises in a free, and convenient way. How can the Safe Helpline app help me? We’ve redesigned the app to give you a way to access any resource within the app directly from the home screen. Chat: Access one-on-one support through the Online Helpline, 24/7 and chat directly with a Safe Helpline staff member. Call: Connect directly to a Safe Helpline staff member for one-on-one support through the Telephone Helpline, 24/7. You can choose to make the call using Voice over IP (VoIP) or by using your cellular data. Using VoIP might be a good option for Service members who are OCONUS and may not have access to cellular service in their current location. Learn: Within this section of the Safe Helpline app, you can access our self-paced educational programs to learn how to address the effects of sexual assault, how to support a survivor and ways Safe Helpline can support you or someone you know. All of these education programs can be completed anonymously by the user. You’ll also be able to access scenarios to give you tangible ways to step-in and support others. Self-Care: The app allows you to easily create and use a customized self-care plan with specially designed self-care exercises. Once downloaded, you can come back to view your plan and exercises at any time, even without an Internet connection. How do the self-care plans work? The self-care plan is created by answering a series of six questions designed to help you focus and identify how you are feeling at that moment. Questions are answered on a sliding scale of zero (never) to five (always), and the app will recommend different exercises based on your responses. There are no “good” or “bad” answers to these questions, and responses can vary from day to day, depending on how you are feeling. We recognize the importance of keeping your information safe, so we’ve also set up a security feature that allows you to lock your self-care plans behind a privacy wall using a 6-digit pin of your choosing. What do you want to let go of this week? What are three things that you would do if you weren’t afraid? Like the self-care plans, the journal entries you save are protected by a privacy wall and will allow you to lock your information behind a 6-digit pin of your choosing. You can also access and refer back to your journal without an Internet connection. Sometimes focusing on a mindless activity can help you process difficult emotions and be grounded in the present. To help with this, another self-care activity available on the app is a collection of six designs, ranging from easy to difficult, that allow you to paint or color your own works of art. How is the Safe Helpline app secure and is activity on the app traceable by third parties? As with all Safe Helpline services, your privacy is of utmost importance, and the technology behind the Safe Helpline app was created by RAINN to protect your safety and anonymity by ensuring that no personally identifiable information (PII) is collected. The app does not require an email address or any of your contact information when it is initially downloaded. You have the ability to set up a pin code to protect the information you record in the self-care plans, the journal, and completed coloring book designs. No information on how you use the app is ever collected or shared. This includes how often you use the app, who uses the app, or where you use the app. If you are concerned that someone may be able to access the app, you can delete all journal entries, self-care plans, and completed coloring books by simply deleting the app. While Safe Helpline has taken the steps outlined above to help increase the safety and anonymity of Safe Helpline app users, please remember that if you are using the app on a DoD or other work-related device, your employer may be able to track your usage of this app.